Anemarrhena rhizome (Zhimu)-Anemarrhena asphodeloides Bge. Botanical Name: Anemarrhena asphodeloides Bge. Part Used & Method for Pharmaceutical Preparations: The rhizomes are gathered in spring or autumn. After the fibrous roots have been removed, the rhizomes are cleaned, dried and soaked in water. Finally, the skin is peeled off, cut into slices and baked with salt. Meridians: Lung, stomach and kidney. 1. Excessive heat at the qi level: Anemarrhena rhizome (Zhimu) is used with Gypsum (Shigao) in the formula Baihu Tang. 2. 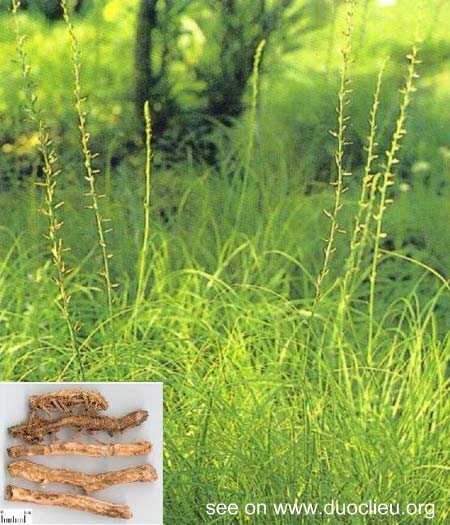 Cough due to heat in the lungs or dry cough due to deficient yin: Anemarrhena rhizome (Zhimu) is used with Tendrilled fritillary bulb (Chuanbeimu) in the formula Ermu San. 3. Deficient yin of the lungs and kidneys with heat signs manifested as afternoon fever, night sweating and feverish sensation of the palms, soles and chest: Anemarrhena rhizome (Zhimu) is used with Phellodendron bark (Huangbai). 4. Diabetes manifested as extreme thirst and hunger and profuse urine: Anemarrhena rhizome (Zhimu) is used with Trichosanthes root (Tianhuafen), Schisandra fruit (Wuweizi), Ophiopogon root (Maidong) and Pueraria root (Gegen) in the formula Yuye Tang. Cautions & Contraindications: This herb is contraindicated in diarrhea due to weakness of the spleen.